Once again I have the privilege of presenting at the PDTC to amazing peers in education. While I have nothing close to ‘all the answers,’ I appreciate the opportunity these sessions give me to learn from others and clarify for others what has worked for me and my context. If you are looking for resources to support what was discussed in the sessions, please see the information attached below! This presentation was originally presented at the Canadian Student Leadership Conference 2017 in Waterloo, Ontario. It was amazing to see the response of the students to concepts such as servant leadership and growth mindsets. We have so much to gain with our students and in our society if we focus on fostering growth mindset and looking for opportunities to serve in our world. What choices do your students have each day? I was thinking today about the choices we give students. When I look at my classroom through the eyes of a student, what would I see in terms of my personal choice? How many times during the day could I offer my unique perspectives, an answer that isn’t exactly what the teacher wants? Some days I think it could be very challenging in school to just have no opinions. Yet, so many of our students experience this very thing on a daily basis; moving from class to class with only notes to write, questions to answer and results to find. My hope is that you looked at the title of this post and could easily list off the ways your students are able to take charge of their learning, how they can make their learning count in every minute of your class. If you aren’t there yet, maybe there are some ways to integrate student choice into your learning environment. As a high school English teacher, I often felt constrained by the requirements of curriculum to teach and follow certain texts. Not a great deal of choice right? What I found is that there was more there than I had considered. Not only could I vary how a student approached the text, but I could also vary the required outcome. So though I as the teacher may have wanted a certain learning outcome associated with each project, sometimes the students were better at choosing what was important about each project for themselves. As long as they knew the overall outcomes for the course, flexibility in the response was a worthwhile expression of their autonomy. Often it meant that they would complete assignments that they didn’t want to in order to get to do what they had a strong desire to work on. Even if there isn’t an immediate method to create choice in the content of the project; solicit initial thoughts, beliefs and feedback in the introduction, feedback loops or review of an assignment. Often there are ways to give students choice in their manner of responding to their learning, if we take the time to do it. Think about the things that seem most resistant to giving students choice, those items that require direct instruction or monitoring perhaps. Even giving the students a moment to speak about what they feel about that learning process can be beneficial. As an adult learner, I know that time to reflect on my learning with someone else is often as useful to keeping me involved in the learning as if I were doing the steering of the learning myself. Better yet if that feedback is collected and has some impact in the learning process. Making choices allows us to feel a little more in control of our learning process, and can ultimately be the difference between what a student “Had to do,” at school versus what they “Got to do.” I’m always hopeful as a teacher and a parent that the latter perspective is the one that the students in my life are able to experience. Change is hard. In education, it can be downright terrifying. As teachers, we pride ourselves on routine and having the answers for everything. Often, a focus on routine means sticking to very specific types of teaching, assignments and assessments. This can certainly make teaching more expedient and manageable, but I would argue that by introducing change, we often have the opportunity to make education better. We give students a chance to experience different ways, new experiences, and some of that ever-vaulted creativity we are looking to instill in burgeoning minds. I have changed enough in my practice and worked with enough teachers to know that you can’t change everything right away, nor should you. Many of our practices are good, and are rooted in excellent pedagogy. So start with something you’ve never been 100% sold on, something that doesn’t feel excellent when you teach it. When I first did this, I found that I was so excited to get rid of the part of the course I felt was weak, the excitement got me halfway through the work it took to redesign it. But what to do with it? That’s another challenge that teachers face when dealing with the unknown. While there are enough theories and ideas out there to make your head spin, I would suggest picking something one of your peers is doing or has already done. There is strength in experience, and you can always learn more about new techniques, but having someone who has already ‘walked the walk’ will give you a place to turn when inevitable challenges arise. If you are having trouble with ideas or there is no one around to help, visit my contact page and drop me a line. Supporting teachers is what I do, and I am always willing to support as I can. If you really have no inkling of how you’d like to change, check out Twitter, or some my previous posts such as: Creating a Buzz in your Classroom, Project-Based Learning: Writing a Classroom Novel. Also, if there is a post on a topic you are interested in that you would like to request, please do so through the contact page! There will be more ideas and inspiration forthcoming! I had the pleasure of being asked by Jonathan Mugan if I would give his new book The Curiosity Cycle a read and possibly a review on this blog. I was glad to oblige, any book that deals with children’s curiosity was something I am willing to take a look at. I’m not sure if I would have come across Jonathan’s book in my regular travels, but I am certainly glad I had the opportunity to read it. First off, this is not an education exclusive book by a long shot. In fact, many teachers I know would intuitively teach in many of the ways Mugan describes in the book. Teachers are innovative individuals, and curiosity is at the heart of what many excellent teachers do. One of the greatest traits of The Curiosity Cycle is that it is written in an accessible manner for parents. In fact, the main audience is parents, and how to inspire a lifelong learner in your own home. By knowing how curiosity works, a parent can ‘tune in’ to the way a child’s mind works and guide him or her to fill in knowledge gaps and extend their curiosity forward. This is an excellent image to keep in mind when interacting with children; and if you do, it quickly becomes apparent how spot-on Mugan’s perspective is. While I’d never really thought of curiosity as a cycle of filling in unknowns, Mugan does an excellent job of finding concrete examples of how this happens in a young mind. This process of leading the reader through examples and then analysis of the cycle, shows the depth to which Mugan has obviously analyzed and thoughtfully presented the concept of creating and testing mental theories, developing new ones and filling in the gaps of knowledge. This is where his book becomes a great resource for teachers, because as you consider in your learning plans how a child’s mind may be inspired to learn more and seek completion of the theory they are working with, you may find your lessons become more engaging and focused on the inquiry of the students. At least I found mine did. I am so happy that Jonathan reached out to me, and I feel I am that much better of a father and teacher for reading his book. I realize the summer reading times are behind us now, but The Curiosity Cycle is a quick and easy read, one that I fully recommend. I spent my day today touring around and discussing learning commons’ in both Rocky View and in Calgary, and I have to say, it has been some time since I have been as excited about a project as I am about our school’s transition to a full-fledged learning commons. Due to space considerations, our traditional library lost it’s conventional ‘home’ in the school two years ago (I am now teaching in that space) and at the time it was a hard feature of our school to let go of. Our librarian worked exceptionally hard to transition the books and other physical attributes of the library throughout the school, and met with success with this reimagining of how books could be shared and used. It was a commendable effort, and truth be told, there are many features of the learning commons around our school right now, including the open sharing of learning tools, reading and literacy resources, interconnectedness of classrooms and production of 21st century learning artifacts using embedded and transferrable technology. However, since the inception of our broad learning commons, the one thing that has been missing is that ‘home’ of the program, that sense of place. Our librarian has a desk, yet in the true spirit of the learning commons, the truly adaptable learning space that is tailored to student learning simply was not available. development of the library commons culture, and a desire by administration to support it as a hub of the school. I’m not sure what our final learning commons is going to look like, but I am certainly excited to be on this journey and to be part of the team. What a great opportunity to support learning and help create something spectacular for our students! I have had a great deal of fun on chats and in working with teachers over the last little while reminiscing over some of the greatest things they have done in the classroom. We don’t often take the time to reflect back on our ‘best work,’ but many of us have exceptional ideas that we have come up with during our careers that have been ‘shelved’ for whatever reason. Maybe it didn’t fly with the class we had, or maybe it was time consuming and we put something more expedient in its place; whatever the reason, I challenge you to go through that shelf of dreams and resurrect some of the greatness that has been you in the past. I have done this lately, and have a big one coming up in the next week, and I can tell you that it makes a big difference to the passion you show in the classroom. These are the ideas that strengthen us as teachers, that give us purpose and let us dream a little. Often the ‘shelved projects’ involve collaboration, outside experts or help, organization, special supplies and preparation, and because they require that little bit more, they are memorable for our students! I know this is the time of the year when we are tired, struggling, and need that little ‘something’ to get through to the end. Maybe we can find that little bit extra in a project we put away. It has worked for me this week, will it work for you? Take a moment to talk about one of these projects in the comments, I will share some of them out on Twitter and maybe we can support other teachers in need of a boost in the final stretch! When we were working toward going 1-1 with school-owned devices in our school, we realized that the process would be a drawn out one if we couldn’t cut some costs. Retail cases, high-priced charging stations, and expensive management options were not in the cards for us. So we opted to get creative. It took some research, some elbow grease and some innovation, but we were able to come up with some very effective solutions for outfitting our devices, allowing us to get more iPads into more student hands sooner. So, in the spirit of maximizing the little money we have in education fro these kinds of purchases, here is the process, and the pictures to help you build your own iPad mini cart! *this cart MAY work for regular iPads as well depending how well you space the levels of the racks, but I have not tested it. The Raskog Cart was the right size to fit about 30 iPad Minis side by side on the three levels, and was available to us at only $60 per cart. We needed some other accessories, but it was a good start. 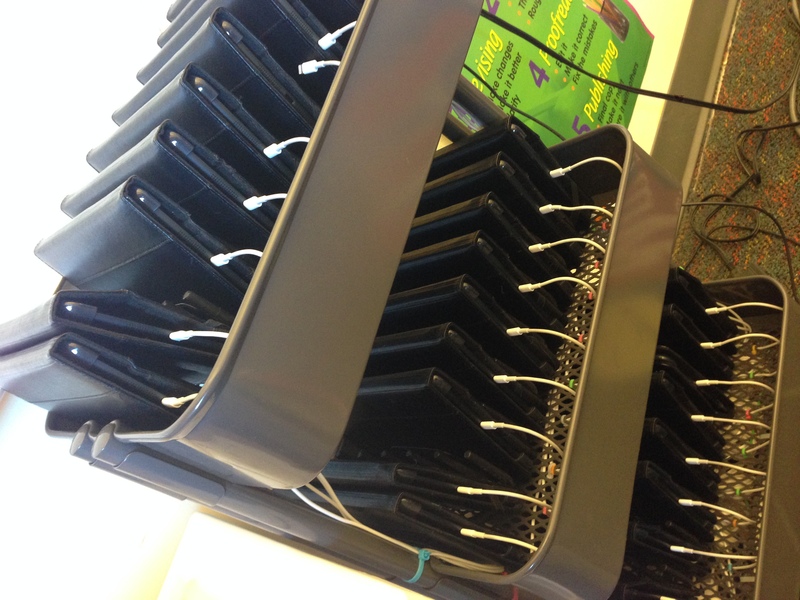 Next we needed some way to keep all the iPads in the proper location on the cart. Thanks again to IKEA we found some dish racks that suited our purpose. 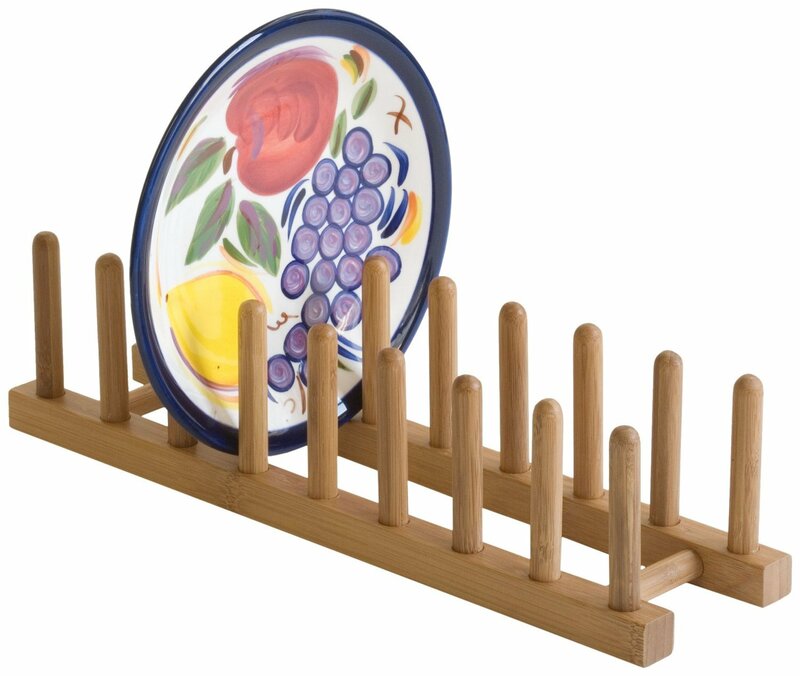 (BOHOLMEN $9) When our local IKEA ran out we sourced some others from Amazon ($10) as well. We needed three of these racks for each cart, one on each level. Each of these 4-port USB Charging Stations can charge 4 iPad Minis using one outlet plug. It took some research to find this particular charger because most USB hubs do not charge devices, even if they are powered. 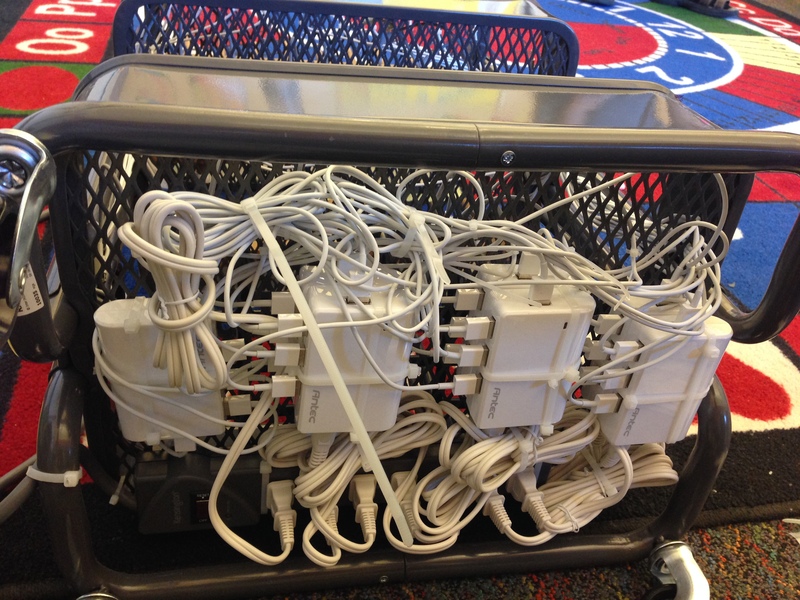 With these hubs, they are strictly meant for charging, not syncing, so they fit the bill for a classroom cart. With no more than 28 students in each of our elementary classrooms, we could use a 7 port power bar ($20) and 7 USB hubs to power all of our iPads. If you needed more iPads on the cart, you could source larger power bars as well. All that was left was to run wire and use an extraordinary amount of cable ties to keep it all in place. 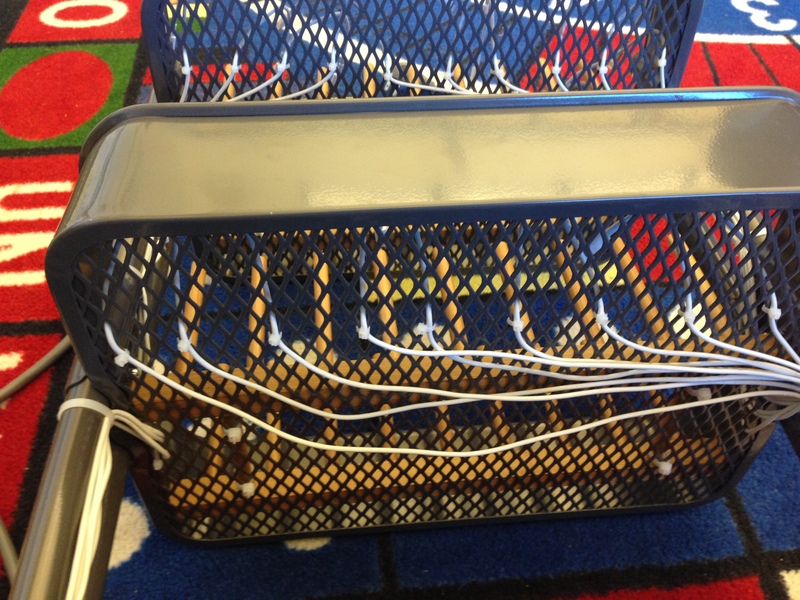 I started by securing the racks in place, and then laying an iPad in the first slot to measure how far out the charging cable needed to be, leaving a little play for students so they would not have to ‘pull’ the cord. 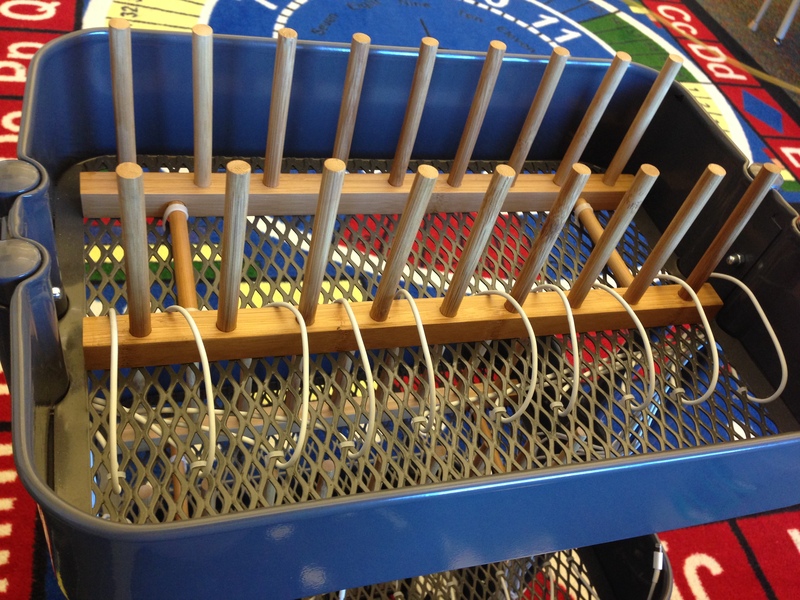 Find the right spot for the cables, and a convenient length for each, then cable tie them into place. A view from the bottom, showing how each cable is tied to the mesh frame. I then cable tied all the cords to one side of the cart leading down. Note that the USB cables must be fed all the way from the bottom, unless you want them to have to travel down the outside of the cart to the Antec hubs. Lead the cables to the side and secure them to the inside of the cart leading down, Your cords will be different lengths at the bottom, but that’s ok.
Once all your cables are leading through to the bottom, find the most convenient USB plug to put them in, wrap and tie down excess cord. Mine didn’t look pretty, but the key is that no cords will be hanging down and left to drag on the ground or get caught on anything. Don’t spare the cable ties, get EVERY cord. You can see the attached power bar, 7 plugs leading to hubs, and many wires charging happy devices. This is what the final product looks like in my classroom. The finished cart, with all the iPad minis tucked in for the night. It is compact, portable (the carts have wheels) and costs…$320 versus the thousands you could spend on a manufactured cart. 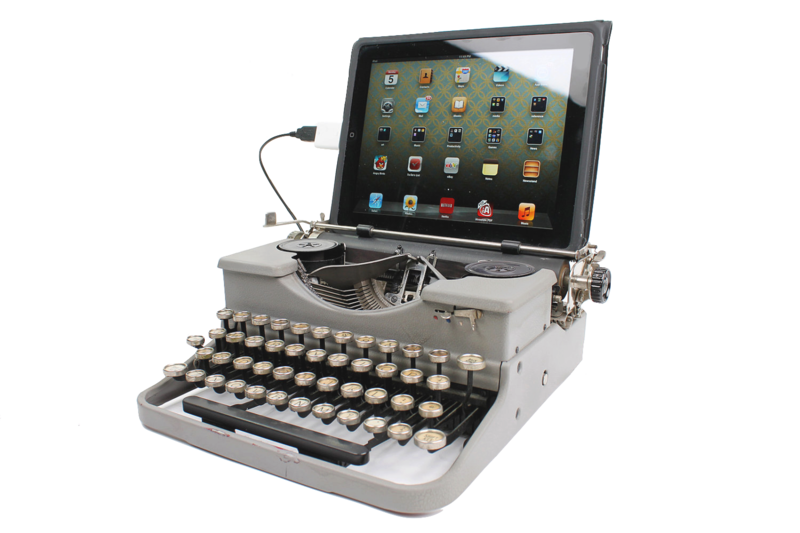 As I said earlier it takes some work, but ultimately we had much more money to spend on devices for students by using some ingenuity. Another consideration we discussed was security, but our classroom doors remain locked in off times at our school, and during the summer months, these carts can easily be transferred to a secure location in the building. At this time we are comfortable with that, but I know this may not be the case for all schools. If security is a concern, you may wish to look at locking mesh bags as a security measure. Let me know if you have questions, or found this useful. I receive questions about our project all the time, and I am happy to respond as I can. In my iPad Oddities session today I was asked about resources for finding effective iPad apps and apps that are on sale. So I have decided to put together some of the best resources around the ‘net to locate apps that a teacher may want to use in the classroom. Obviously, any list such as this cannot be exhaustive and certainly is subject to change, but these are sites I use to research apps for apps I may want to use. Apps Gone Free – This app will give you leads on apps that have gone from paid to free on the app store. There are hundreds or thousands of these apps daily, and Apps Gone Free aggregates them and gives you leads on the ones that will likely have value to you. Teachers With Apps – This website features reviews of apps that are added on a regular basis. I like the layout of this site, and that they give direct iTunes links with each review. It is an effective, organized site. iEAR.org – While this site hasn’t been updated in some time, it was a very effective site and still has great reviews to offer of apps that were listed before they stopped publishing. I like the layout of this site, and the fact that they categorized by level and subject matter. All reviews are written by teachers for teachers. Listly App Review Site – This Listly post links to a Google Doc that is managed by Lisa Johnson. It is a comprehensive list of sites for finding educational apps, a fantastic resource for teachers. If this isn’t enough, feel free to drop me a line on Twitter and I’ll search out whatever you’re looking for!